dressed up like a lady: Unintended stylishness. 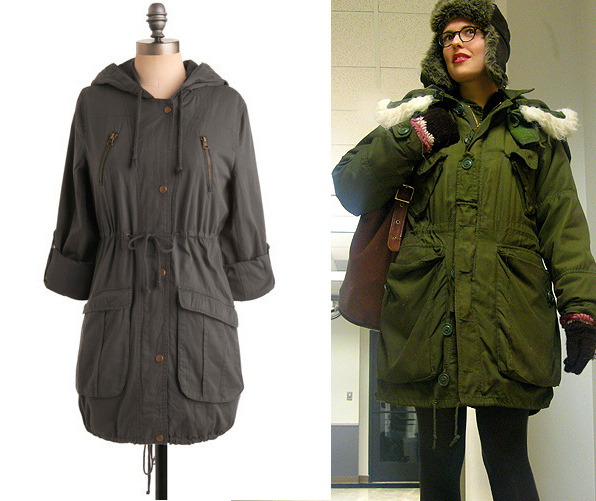 Supposedly spring is here, so I feel like a BIG dork for saying this, but I really didn't realize that my authentic, USED, Canadian Combat Parka was ever in line with anything vogue. But apparently it was fashionable all along, as I just found Modcloth selling a BB Dakota fashion-only (read: not created to keep you warm) version of it. Which must mean it was filtered down from the catwalk multiple seasons ago. Go figure! I was just trying not to freeze. You can probably bet that the fashion version -- be it high end or low -- will not weigh 15 lbs. with all its insulation (not an exaggeration) and protect you proportionately from the cold. But the fashion version probably won't arrive smelling like glue either. Whatever, soon it'll be too warm for this coat anyway. I hope.